Any Moby1 owners here? Looking at placing an order for a Moby1 XTR. Was hoping to hear some owners feedback. Fit, finish, etc. I thought JPK (user name) had one... however I could be mistaken. Silver-bolt, did you find out any more about these? We are also looking at one. Looks to be a quality trailer, I have not seen their frame, as their advertising does not show it. I did request information on them. They seem to be building more for off road than others. Moby1 is a nice trailer. I really really really thought about getting one. Thank you. I will send JPK a PM. Further along in that thread he comments on his trailer, but near as I can tell he never started a thread on the trailer. 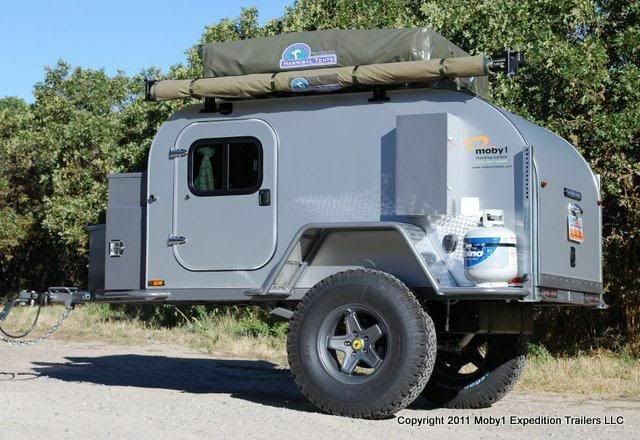 Seriously looking at the Moby1 trailer and was hoping to find someone that had one or had seen one in person to 1) verify they are not "ghosts" and 2) comment on build quality and functionality. Will sub to this since comments/reviews on the Moby1 are a bit tough to find. I really like the look and options of the Moby1. Thanks in advance!!! It seems moby1 owners are far between, I sent them a message on their web site and no one answered it. When I was trailer/teardrop shopping (maybe 6-8 weeks ago), I sent them an e-mail and they got back to me right away, including the sheet of option prices that I asked for. I did PM JPK, so far no reply. Moby1 did send me the options list but nothing on how the cabin is constructed. Want to know if the cabin uses a metal tube frame or is it all wood construction. I guess I will have to fly to Utah to see first hand before I place an order. I e-mailed as well and have been sending some e-mails back and forth on a possible build. On a side note I am also looking into a SoCal Tear Drop just to see which one may fit better. I got some e-mails from Canyon Country Tear Drops (One of SoCal's Regional Manufacturing Facilities that is closer to me) and they seem good to deal with also.